Pick up where your child left off in the first Math Bakery or begin learning column addition and subtraction the Math Bakery 2 way. Either way, it's a great app to use. 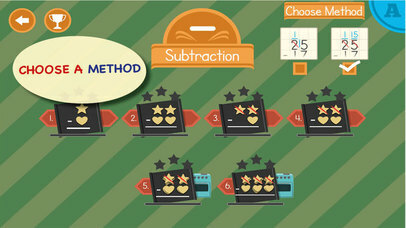 Maths Bakery has introduced many children to simple addition and subtraction using its clear and supportive approach. The follow-up app, Maths Bakery 2, keeps the visual scaffolding and attractive design to take children's understanding of addition and subtraction into using the column method. The characterful baker and his children are back in this app using cookies on a baking tray to visually represent the maths that children are doing. This provides a useful connection and continuation to the previous app. Rather than have to familiarise themselves with a new interface and method, children used to the preceding app can move straight on to extending their learning further. Not that this app is difficult to use for newcomers to the series. Its options are easy to access and it supports learners visually and verbally. Each level steps up the complexity of the arithmetic slightly and the process of using the column method to add or subtract the numbers is established as children play. 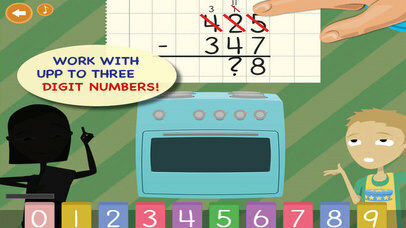 It is great to see that the app does not impose its own style upon children's calculations. Two common ways of showing the carried numbers are catered for. They can either go above the original numbers or below them. The option of it being below the answer line is not included but this is rarely used by teachers nowadays. Because the app wants the player to use the column method to add the numbers, it can be a little confusing when numbers are easy to add mentally. In these cases, it is instinctive to write the number from left to right and wonder why the app won't allow it. It is because it wants you to enter the units first and then the tens. It doesn't cause any problems with the learning but players do have to keep it in mind throughout especially when their skills improve. The app is at home both on a parental and school device. The music and sound effects can be toggled off and on, avoiding the potential cacophony from multiple children playing the app at the same time. Children can independently work through Math Bakery 2 even if their literacy is not well developed. Multiple users can have an identity in the app so that their own progress can be preserved and used to inform teachers' assessments. Progress through the addition and subtraction sections of the app are recorded separately so that problems in just the one area can be spotted. A fun duel section of the app adds longevity and the chance for some further thinking. Children take it in turns to set each other a question. As this is a duel, it is meant to be competitive. The question setter will need to think about the hardest questions to solve which they will soon realise are not the highest numbers but involve carrying numbers. They will quickly be able to spot which sums need to use the most complex aspects of the column method. Both parents and teachers could make effective use of the app in a one-to-one situation. The visual layout of the maths is ideal for an adult to draw out deeper thinking and understanding from children they are working with through each level. Math Bakery 2 keeps the bargain price and freedom from in-app purchases and ads of its predecessor. It provides superb value for parents and teachers and effective learning for children. 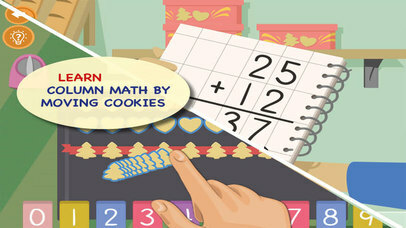 Math Bakery 2 - Continue Counting, is a perfect tool for learning and training column addition and subtraction. Regrouping is achieved super-fast by using a finger to slide between 100s, 10s and unit columns. Tasks are animated using cookies which can be added to or removed with a finger movement. 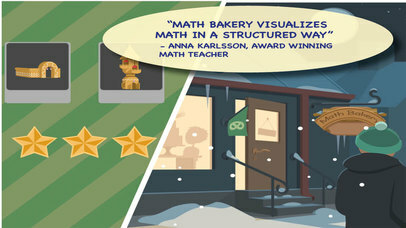 Math Bakery is thus an intuitive and interactive teaching tool, which is currently being used in many schools in Sweden and Finland. Using step-wise help utilities the student is directed to a correct solution without feeling inadequate. If not successful at the first attempt, appropriate help is instantly available. A ’friendly’ reward system encourages students to challenge each other in collecting cookie jars for building a gingerbread house. Math Bakery 2 includes 14 games with varied difficulty using numbers up to 999. In ’The Duel’ two or more students challenge each other or a grown-up to set or solve problems. Simply choose playing time and level. Help functions at several stages. If the first attempt is wrong, hints are provided. Possibility to speed up for a more challenging game.